“The mining industry is in a really good place at the moment. It is continuing to go from strength to strength therefore bringing these Excavator’s down under was a logical choice”. National Group’s premier brand; National Plant & Equipment (NPE), has delivered the first of their two new Liebherr R 996B Excavators to Fortescue Metals Group’s (Fortescue) Christmas Creek site. A global leader in the iron ore industry, Fortescue was the first to secure the rental on these world-class machines as part of the Company’s continued commitment to improving productivity and efficiency across their operations. After arriving in Perth from Liebherr’s manufacturing facility in France in late June, the first excavator began a four-week pre-assembly by Liebherr. From there, the large load was transported by National Heavy Haulage from Perth to Christmas Creek, at which point the final assembly took place on site before being handed over to Fortescue to go to work in early September. Making yet another timely acquisition was National Group’s CEO and Managing Director, Mark Ackroyd, who says “the mining industry is in a really good place at the moment. It is continuing to go from strength to strength therefore bringing these Excavators down under was a logical choice”. The Liebherr R 996B is renowned as an outstanding piece of equipment all over the world with the ability to achieve the most challenging targets in the most demanding conditions. The machine is equipped with two V16 Cummins engines specifically designed to withstand extreme environments and to minimise downtime, along with a high-pressure hydraulic system and optimised pipe and hose layout to maximise operational efficiency. 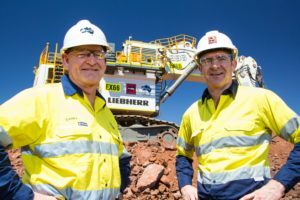 Mr. Ackroyd visited the Christmas Creek operation last week and was buoyed by the long-term partnership with Fortescue saying “it’s no secret that business is built on great relationships, so to continue our valued partnership with the team at Fortescue is something that is very important to us”. NPE’s already large fleet is about to get even bigger with confirmation of new equipment arriving in the country every month for at least the remainder of 2018, including the second of these excavator’s which will arrive in late September. Sign up below to receive the latest updates on all of our future builds.